Some questions seem to get asked over and over again. Hopefully this list of answers to "frequently asked questions" will be helpful. How can I buy something from your company? The Muscle Car Research web site uses an online shopping cart system that allows you to select and pay for products online. Look for the "Add to cart" button on each product page - it lets you select a single item to be purchased. When you click on this button the item gets added to a virtual "shopping cart", which keeps track of all of the items that you'd like to buy. After adding your items to your shopping cart you can click on the "Checkout" button to provide your billing, shipping, and payment information. Payment can be made using PayPal, credit cards, money orders, and personal checks. Please note that you do not need to login or create a user account to place an order! You will have the option to create an account during the checkout process if you wish to keep track of your orders, but it's not required. Orders can also be placed by telephone, but since this is a part-time business we can only process telephone orders during a few evening hours in the US eastern time zone. Please try to use the shopping cart system. If you really can't figure it out, please contact us and we'll make arrangements for a telephone call. We also have a dealer program for business partners. Dealer orders can be placed by purchase order or by using the shopping cart system. Can you rebuild my proportioning or distribution valve for me? Sorry, but I don't offer a general valve rebuilding service. The only valves I'm interesting in rebuilding are those that aren't yet listed in my catalog. Please contact me if you have an unlisted valve and you're interested in having it rebuilt. I'll let you know if I can help you. Please have a picture or two handy. I bought something from you a while ago. Where's my package? Muscle Car Research ships all packages through the US Postal Service (USPS). You will receive updates via email documenting the status of your order as your order is processed. Please pay attention to these messages - at least one of them will contain the delivery tracking number provided by the USPS. You can use that number to track the delivery status of your package directly from the USPS web site. You can also find your tracking numbers in the order summary associated with your Muscle Car Research web site user account. Please check with your local post office if the USPS tracking system says that your item was delivered. Please note that delivery tracking information is not available with USPS First Class Mail International shipping. Please use USPS Priority Mail if you need faster delivery with tracking for an international shipment. I have a (insert car year, make, and model here). Which rebuild kit do I need to repair my brake valves? I currently offer brake valve rebuild kits for a limited number of vehicles. My catalog is structured by model year and valve type. Kits for cars originally equipped with 4-wheel drum brakes are identified as a "Drum Brake Pressure Differential Valve Kit". Other kits are used for cars equipped with front disk and rear drum brakes. If you're not sure of the type of valve you have just read the description for the kits that are appropriate for your model year - the description includes a list of vehicles for which the kit has been confirmed to be appropriate. If you're still not sure, feel free to contact us. Even if I don't currently list a match for your valve, the odds are pretty good that one of my kits contains the parts you need. Though stamped with different engineering numbers, many valves used during a particular model year differ only in the mounting bracket used. If I don't already have an appropriate kit I almost certainly have the parts on-hand to produce a new kit that's specific to your vehicle. If you're willing to send me the valve so I can take a look inside I'm sure I can either identify the appropriate kit or come up with a new one that includes the parts you need. My brake system warning light is on. Why? Use hydraulic pressure to center the piston. What is a metering valve? A metering valve (sometimes also called a hold-off valve) is designed to engage the rear brakes just before the front brakes on cars equipped with front disk brakes and rear drum brakes. It does this using a combination of springs, seals, and pistons to restrict fluid flow to the front brakes until a relatively low fixed threshold pressure is reached. Forcing the rear brakes to engage prior to the front brakes is supposed to enhance braking stability. Metering valves can be used as stand-alone valves or as part of a larger combination valve. They seem to be more common on cars built in the early 1970s. 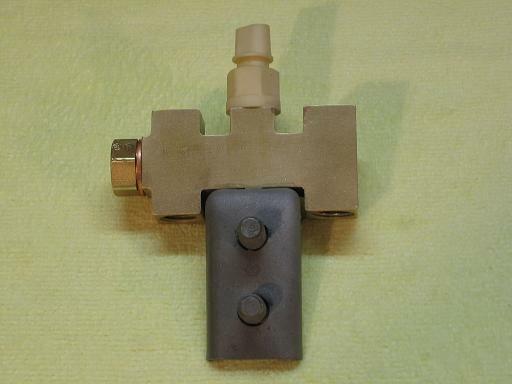 The metering valve image below can be found in the 1970 Chevrolet chassis service manual. What is a pressure differential switch? A pressure differential switch (sometimes also called a distribution block or tee) is designed to detect a difference in brake system pressure between the front and rear portions of the braking system on a car equipped with a dual master cylinder. 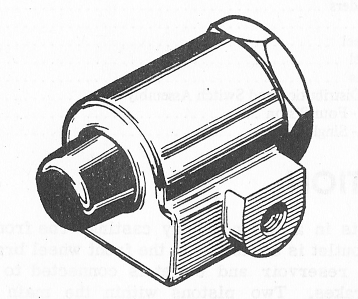 The switch assembly contains a sealed piston (or pistons), an electrical terminal, and sometimes springs. The piston moves from a centered position when the fluid pressure on one side of the piston is higher than the other, usually as a result of a fluid leak. When the piston moves off-center the switch is closed, completing a circuit to chassis ground and lighting a warning lamp in the instrument cluster. Pressure differential switches can be used as stand-alone parts or as part of a larger combination valve. If you see an electrical switch on a valve you can be sure that you're looking at a pressure differential switch. What is a proportioning valve? 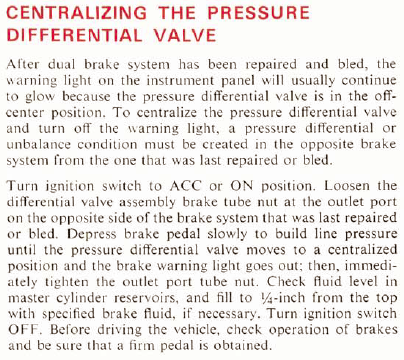 A proportioning valve is used to reduce the amount of brake fluid pressure applied to the rear brakes. They are often (but not exclusively) found on cars equipped with front disk and rear drum brakes, and are not typically found on cars equipped with four-wheel drum brakes. The valve assembly contains a combination of seals, pistons, and springs that work together to reduce the pressure of fluid passing through the valve. Proportioning valves can be used as stand-alone valves or as part of a larger combination valve. OEM valves are typically configured to provide a specific output pressure, but adjustable valves are commonly available in the aftermarket. They are often used when adding front disk brakes to cars originally equipped with four-wheel drums.